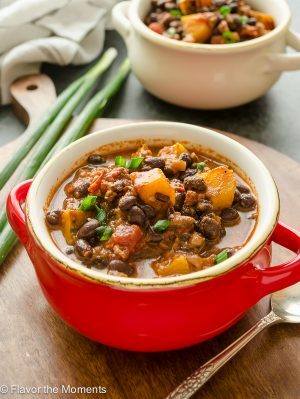 Chorizo Black Bean Kabocha Squash Chili Author: Flavor the Moments Chorizo Black Bean Kabocha Squash Chili is a hearty chili that's packed with spicy chorizo, black beans, and sweetness from kabocha squash and a hint of maple syrup. It's the ultimate fall chili! Heat the oil over medium heat in a large saute pan or Dutch oven. Add the chorizo to the pan and break up into pieces with a wooden spoon. Add the red onion and saute for 5 minutes or until the chorizo is cooked through and the onion is softened. Add the kabocha squash and saute one minute, then add the garlic and spices and saute for 30 seconds more. Add the tomato paste, diced tomatoes, and 1¾ cups of the chicken stock, and stir to combine. Bring the mixture to a boil then reduce the heat slightly and simmer. Once simmering, mash ½ can of the black beans with the remaining ¼ cup of chicken stock and add to the pot (this will thicken the broth slightly). Add the remaining beans and maple syrup, and stir until incorporated. Simmer for about 10-15 minutes or until the kabocha squash is tender. Season with salt and pepper, to taste. Serve garnished with chopped green onion and enjoy! If the chili is a bit thick for your liking, add about ½ cup more stock. Veggies may be prepped ahead to make this meal go even quicker, and the chili may be made up to a day or 2 in advance. It's also freezer friendly!